In the fashion industry, the aspect of sustainability has become a must. Last but not least, the consumers are calling for a more sustainable production of textiles, and the industry still shows great potential. In 8 out of 10 cases, the garments are simply discarded in the waste without being reused or recycled. The designer Ina Budde wanted to end this waste of resources and therefore established Circular.fashion. The company provides specific digital design tools with key information that enterprises can utilise in the future to design recycable and sustainable products. With her project, Budde also wants to reach out to consumers. Circular.fashion is a startup business funded with the Berlin startup scholarship provided by Free University of Berlin. Ina Budde founded the company to accelerate circular economy for textiles, with sustainability and avoiding of unnecessary waste being the key aspects. Circular.fashion was presented for the first time at the Ethical Fashion Show for sustainable lifestyle and fashion within the scope of the Berlin Fashion Week in January this year. The young designer’s business sees itself as design consultancy company, serving both designers, manufacturers, recyclers and consumers. Moreover, it provides the basis for a high-grade fibre-to-fibre recycling, in contrast to the common practice of “downcycling” where the loss of value is tremendous. The concept of the designer, who is a Berliner-by-choice, is based on the ‘Extended Closed Loop Model’. This model is expected to revolutionize the fashion industry as it aims at creating a preferably closed material cycle. The innovative concept of Circular.fashion is based on various pillars. The circular design tool is a platform using a proprietary database and software. Fashion designers and manufacturers can find all kinds of information about materials and details about the material’s reusability. They can further implement manual digital steps towards manufacturing processes that use sorted materials and cause as little excess as possible. As such, the “Circular Design Platform” makes detailed information and practical support available for textile designers and manufacturers. As recycling starts right in the design phase, the concept starts with consultations in the manufacturing phase, for example with regard to the choice of materials. It connects manufacturers, recycling companies and consumers, who will finally determine the garment’s life cycle after use. 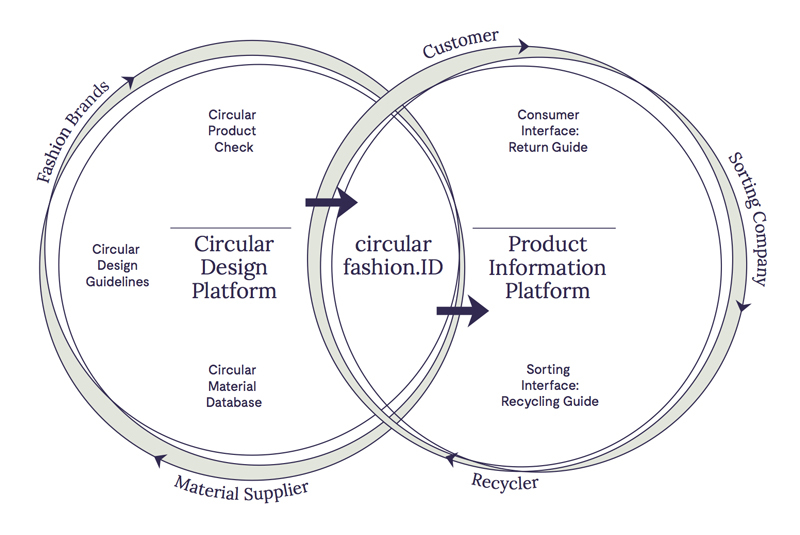 At the same time, Circular.fashion offers a new service to consumers. With Circularfashion.ID, Budde and her team created their own label with embedded QR code that is attached to each garment. This code enables consumers to retrieve online information about the product and track the manufacturing process. This information is also available to recycling companies, informing them about the raw materials being used and about the recyclability of the textiles. Therefore, on the one hand, the code helps consumers by providing transparency, and on the other, the industry can find information that are relevant for recycling. The Circular.fashion team is currently working on postage-free return labels that can be downloaded and printed at home. This way, the garments can be either sold as second-hand goods or made available for high-grade recycling. Circular.fashion already cooperates with a number of fashion labels, including the Berlin label Myrka Studios, which provides their items with the Circularfashion.ID. This way, manufacturers, recycling companies and consumers can have a positive impact on the garment’s lifestyle and ensure that they remain in the goods cycle for a longer time. Ina Budde has received several awards for her innovative ideas, including the Next Economy Award in 2015. Ina Budde is the founder of Circular.fashion. The Berlin startup business offers various tools to promote sustainability in the fashion industry.